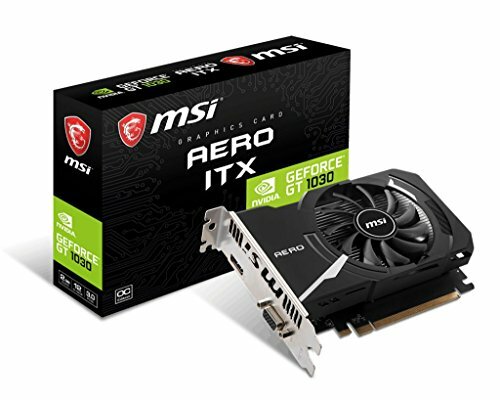 MSI Gaming GeForce GT 1030 2GB GDRR4 64-bit HDCP Support DirectX 12 ITX OC Graphics Card (GT 1030 AERO ITX 2GD4 OC) by MSI at Andy Pemberton. MPN: GT 1030 AERO ITX 2GD4 OC. Hurry! Limited time offer. Offer valid only while supplies last. Accelerate your entire PC experience with the fast, powerful NVIDIA GeForce GT 1030 graphics card. Perfect for Gaming, HD video and picture editing. Accelerate your entire PC experience with the fast, powerful NVIDIA GeForce GT 1030 graphics card. Perfect for Gaming, HD video and picture editing. The GT 1030's award-winning NVIDIA Pascal architecture, powerful graphics engine, and state-of-the-art technologies give you the performance upgrade you need to drive today's most demanding PC applications.